The Skorne community is pretty split on which build of Rasheth is the correct one, and I’m caught somewhere in the middle. I played the Aradus Sentinel Winds of Death version at Seattle Open (battle report coming as soon as I can figure out how many pictures I’m missing from that game, clock got tight) and wasn’t massively impressed by it. To be fair, there were some user mistakes, but I just didn’t think the Sentinel brought enough to the table. This list I have shamelessly stolen from Greg “the silver fox” Schadt. My friend JP is still trying to find a Trollbloods answer to Siege Animantaraxes, and this time he’s trying out his Grissel 2 SotN list. I won the roll and opted to go second for stress testing purposes. The optimal play is (probably) to go first but…who knows. Grissel puts up Dash and Deflection and dumps Fury into the stone. Everything more or less runs, with things staying out of the walk and shoot threat range of the Mammoth, and nothing being able to stay out of trample and shoot range of Animantaraxes. The Stone pops for speed and Awakens up to six fury. I can pretty easily stay out of threat range from most things with Turtles and still move up and shoot, so that’s nice. I make a pretty severe order of activation derp here. I run the right hand Beast Handlers up and then forget to activate the Supreme Guardian first to move up and collect souls. I get a Breath of Corruption on the Yellow Bear Handler and then roll absolute garbage on the damage roll and leave him alive. I also put another into the Bear in the center and spike a bit. I also ding up some Champs and the Bomber with the AOEs. The two Turtles flail at the Fire Eaters in the Snow Banks, but manage to kill one and reposition back so that the only one that the Bomber can shoot at is under Krea. The Mammoth walks up and tries to drift AOEs into things, not doing a whole lot as all of them deviate to the four. He puts up Counterblast. 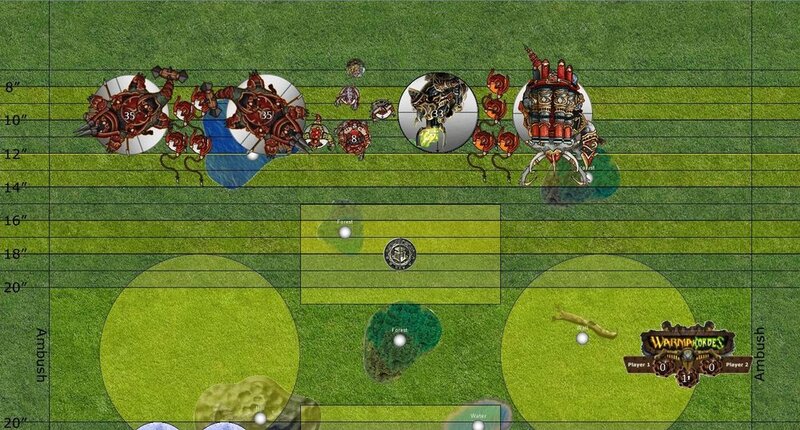 He starts things off by moving the Bomber up, Far Striking himself, and then rolling colossaly nuts on damage rolls against the Animantarax, doing 18 damage in two attacks at dice off 6. The Fire Eaters assault in, but do nothing thanks to the Krea aura. On the right, the Bears move up to threaten me, and the Champs move up in a big old Brick. Grissel has Deflection up again and Feats. It’s pretty clearly Feat turn here, and I run up a Beast Handler such that I can arc into the Bear Handler in the back. Rasheth activates and Feats, killing the Bear Handler with a Breath of Corruption and doing some damage to the Bear with a Sunder Spirit. I should have backed up here, but I sure didn’t. Beast Handlers heal NINE damage off the damaged turtle, and the Mist Speaker gives it guidance. My Animantaraxes clear themselves off with Independent attacks pretty easily. The middle one also kills the Feralgeist and the left Bear before putting a ton of damage into the Bomber with shots. The other one charges down, kills the big troll from the Fire Eater unit and then continues to put damage into the Bomber, leaving it on something like 8. The Mammoth aims and uses his throw gun to chuck all four Champs back 5 inches, killing a couple in the process. He forgets to Counterblast. We both score a point as my Supreme Guardian moves up next to Rasheth. Grissel moves up, Far Strikes, and puts some mediocre damage into the Animantarax. We realize that he’s got a legitimate assassination run onto Rasheth if he baits out my Defensive Strike on one of the Yellow Bears, since he can then chuck two bombs at Rasheth and charge me with a Bear, so he charges his Yellow Bears in. I opt not to Defensive Strike, and they roll fire for damage, leaving the Engine on 5. The right Bomber moves up and finishes it off. On the left, the Bear charges the Animantarax there, doing very good damage, and the Bomber puts two shots into the Battle Engine but misses a shot since the Krea aura makes it DEF 12. The Champs advance again, blobbing up for Defensive line and JP scores two points to none. The Krea Frenzies into the Animantarax and does nothing. Rasheth puts a bunch of spells into the Battle Bear in front of the Animantarax to kill it, Carnivores the Animantarax, and moves back. Beast Handlers heal the Animantarax for six. It goes in and impact attacks the Bomber and the Krielstone, and is then able to RFP the Krielstone with Carnivore so it’s gone forever. It does abysmally into the Bomber, since it had to charge the objective to get the arc I wahted, only connecting with one tail and two shots. The other Animantarax, with no rage tokens, fails to finish off the Beast either. Awkward. The Mammoth advances to contest both zones, uses his throw you gun, and kills a couple more Champs as they all get blasted backwards into each other and the obstruction. The Agonizer does -2 Strength again, the Mist Speaker makes a cloud in front of Rasheth, and no one scores. He pulls fury from the not broken Bomber, and the other doesn’t frenzy. It stands up and wails on the contesting Animantarax, doing incredible damage for dice - 5, and the other Bomber is able to finish him off. Grissel puts up Dash and moves over. The Bears, now immune to free strikes, kill the Agonizer (uh oh) and then three Champs charge in, doing a respectable amount of damage to the gargantuan. His Krielstone, now purposeless, charges my Animantarax and doesn’t do much. JP scores another point here. The Willbreaker moves up and uses Influence to force the left Champ to smack the middle Champ. Rasheth channels Breath of Corruption through the Willbreaker into the middle Champ, which fails tough (yess) and then uses the Willbreaker to channel Carnivore onto the Mammoth. The Willbreaker survives all of this on one box. Rasheth also heals the Mammoth for one. The Mammoth rotates and murders every single model engaging it. Yesss. On the left, the Animantarax rolls like garbage and fails to kill one of the Krielstone guys after missing 3 attacks over this activation, so I cannot control that zone. 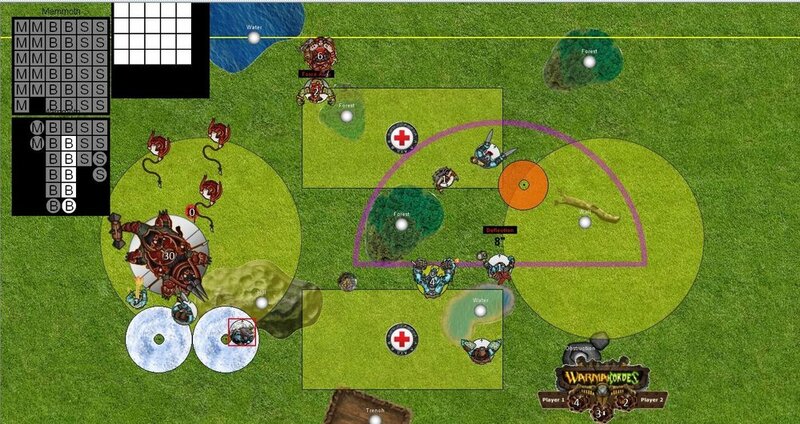 The Mist Speaker runs to contest the bottom zone, and the Krea moves in front of Rasheth and puts up Force Aura. I score one to nothing here. Between Grissel, the Bomber, and the Fell Caller Hero, the Mammoth dies. Unfortunately, there aren’t enough attacks to kill the MIstspeaker as well, so very little else happens on this turn. JP scores 1 - 0. The Animantarax gets loaded up on Rage tokens and the Mist Speaker charges the Runebearer, killing it. 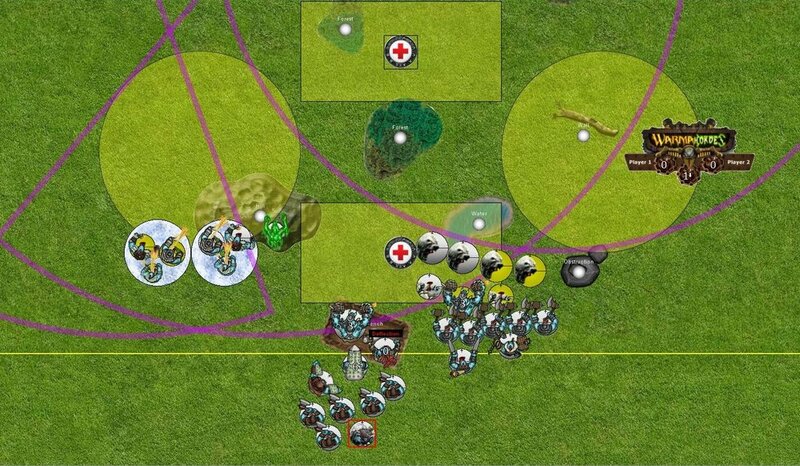 The Animantarax charges and kills the Bomber before repositioning back into the zone to contest both. Rasheth puts Sunder Spirits into the Fell Caller hero until it dies, and the Mortitheurge moves to contest and puts an offensive Puppet Master on Grissel! I score a point here. Grissel moves over and kills the Mortitheurge with a spray. She tries to kill the Mistspeaker as well, but I force a puppetmaster on the first hit which delays the death by one attack. His Fire Eater kills all three Beast Handlers with one spray and we both score one. I kill his objective with Turtle initials and kill the remaining Krielstone guys with shots. Rasheth murders the Fire Eater with a Sunder Spirit. I score a total of three to one this turn. (No picture here either, but barely anything moves next turn. Grissel flubs a damage roll and fails to kill my objective, meaning she only scores one instead of three, and I score two more. At this point, JP concedes since I just have to pass the turn to win. Why is no one looking at Grissel 2? She’s such a monster. Deflection and Dash are both top tier spells, and her personal output is nuts. I definitely feel like if I’d been playing the Winds version with a Sentinel I would have lost this game pretty handily - he would have been obliterated by Bears very quickly.